A classic piece of quality English oak period furniture. 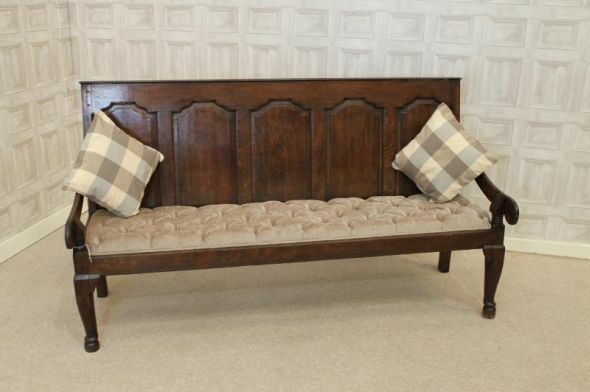 This lovely example of a traditional circa 1800 panelled settle features scrolled side arms and small cabriole legs to front. It is in excellent condition for its age, and has been recently upholstered in a button seat design. We have also added two matching cushions to complement this beautiful piece of furniture. Please be aware that this is an antique piece of furniture, and will show small signs of restoration. There will also be small marks of wear and tear, but there is nothing significant.